Just 4 percent of those who book resorts for groups rarely or never encounter resort fees, according to a recent M&C Research poll of 144 meeting professionals. Such fees have become more prevalent in the past year, according to 57 percent of respondents. Properties typically tack on an extra $15 to $25 per room night, find 75 percent of those polled; 3 percent are seeing resort fees averaging more than $25. This is just one more topic for the negotiating table. In fact, 87 percent have attempted to eliminate resort fees, and 54 percent have asked that they be reduced for their groups. The majority of respondents say those efforts have been extremely or somewhat successful. For more on this topic, see our cover story, "Fee Factor." 44% are less likely to book a property that is unwilling to reduce or eliminate resort fees for a group. 51% say such fees are a consideration, but overall cost is more important. 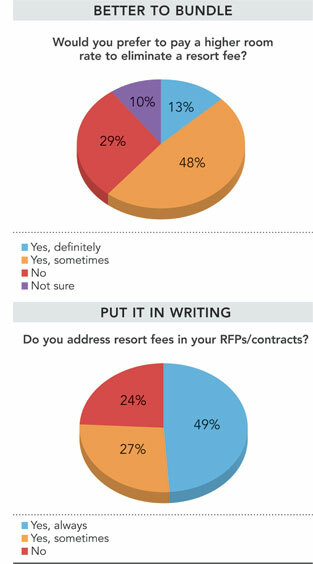 5% do not consider resort fees a significant factor in the decision process. 4% rarely or never encounter resort fees. 43% have successfully opted out of services covered by resorts fee in order to reduce the tab.